This sculpture caught my eye as I wandered around the town of St. Paul de Vence, an old walled medieval village not far from Nice and Cannes. Though quite touristy these days, St. Paul is worth a visit for its architecture, for the small cemetery where Marc Chagall is buried, for the storied hotel/restaurant La Colombe d'Or (where famous artists paid for their meals by leaving paintings and drawings) and for the public art that's scattered all over. This sculpture, by Jean-Marie Fondacaro, is called "L'Envol," or "Takeoff." 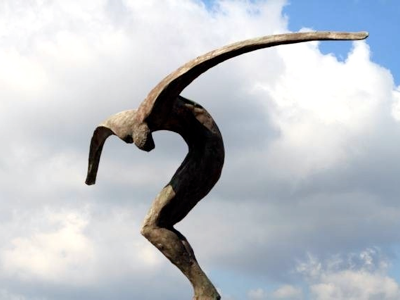 When simply juxtaposed against the sky and clouds, the figure really seems to be in flight. I love it.